So those blasted meteorologists promised nice weather in New York today. I should have known not to trust them! The snippet of sky I can see from my bedroom window looks pretty gray and gloomy to me. But I refuse to let them spoil my plans. I am going to the park today--rain or shine! I'm posting to let you know the outcome of last night's challenge. We had two winners in the end . . . Jin Ai and Hailey. You have to admire two ladies who will happily consume sugared lard just to win a silly prize. (Check out Jin Ai's pictures if you have a chance.) I just hope you guys don't develop nasty Crisco addictions! Now the tie puts me in a rather unexpected situation. I never anticipated TWO winners. And to be perfectly honest, Jin Ai has already won every Kiki Strike-related prize that can be won! (That competitive spirit will come in handy some day--I promise.) So now I have to come up with something new for the two of them. Don't worry, champions. I will be thinking about your prize as I roam Prospect Park this afternoon. If anyone has any suggestions, be sure to let me know! I think I have just entered the twilight zone. First, seal-pops. Next, umbrellas growing on trees. What's next, *gasp* yodeling cucmbers! Ah! The world has gone mad! Ananka--It seems like you're in Brooklyn -- Would you ever consider doing a semi-spontaneous school visit? My sister and I did/ate it together, btw! Congratulations! And you are BRAVE. oh its rainy here too! and Jin Ai and Hailey, CONGRATS!oh, btw, Jin Ai, what does your name mean? it sounds really cool! haha, thanks. In Chinese Jin means benevolence (I think heh) and Ai means love. As Annanka pointed out-it's RAINING . Do you know what that means? Thousands of worms on the sidewalk dieing! SO get out there and save 'em! Pick them up with a leaf and throw them on the grass if you have to! REscue the WORMS!!!!!!!!!!!!!! Great job Jin Ai!~ You and your sis must have stomaches (and tongues) of steel. meteorologists are almost as evil as squirrels. i pretty much do the opposite of what they say here in ********(can't tell you where i live). give them two signed kiki strike t-shirts. anonymous: we should start an organization called HWTSTW (humans working to save the worms). Congratulations Jin Ai and Hailey!!!! If you had that tree in your front yard, you wouldn't have to worry about rainy days! What is it with you people and worms? your slogan could be "saving the world-one worm at a time"
WHEN IS KIKI 3 GONNA B FINISHED!>!?!!?!?!?!??!?!?! Jin Ai, with that stomach of steel you might even be able to stand my mother's cooking....just kidding. She's not too bad. 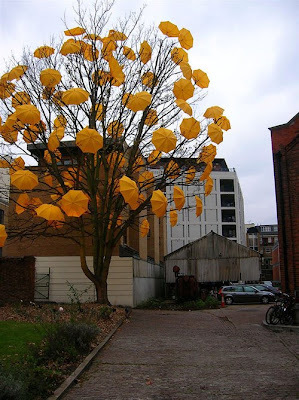 Also I will be collecting umbrellas and doing that to some poor random person's tree. Anyone willing to make a donation? Oooh! Oooh! I know what the prize should be! A little model of a Reverse Pied-Piper! Or a fake bottle of Fille-Filable! um, is it weird that we got no rain? in Manhattan?? oops, when was this written? What was the weather like here?...My memory fails me once again. Aw! The sun is shining brightly and happily inside me! I am in such a happy mood! Lucky, I have been hoping it would rain here too, but actually we have been having 60 degree weather, which is nice, but I love rain and do not hate meteorologists. Congrats Jin Ai and Haley!!!!!!!!!!!!!!!!!!!!!!!!!!!!!!!!!!!!!!!!!!!!! BTW it's really nice where I live, everyone's wearing shorts today. Ha, I'm glad it wasn't raining here, it would have ruined my birthday! It was actually really nice, all the snow was starting to melt! Not gunna say where I live, for all those creepers out there. hey, where ARE the pictures? I can sympathize. It's been raining for days here, but I don't mind. :) I am glad it's clear today because I am about to go on a walk to the slave graveyard down the street from my house, it's really pretty!! !